The second verse of this chapter makes reference to battles that David waged during his reign against the nations of Aram Naharayim, Aram Sova and Edom. We read in the Book of Shemuel II (8:3) that David launched an attack against the neighboring nation of Aram Naharayim when its king "restored his monument" along the Euphrates River. The Sages explain this to mean that the Aramean king seized territory from David's kingdom. David dealt a harsh blow to Aram Naharayim and then to the allied kingdom of Aram Sova, which came to assist Aram Naharayim. The narrative in Shemuel II then makes reference to a battle waged at that time against Edom near the Dead Sea. 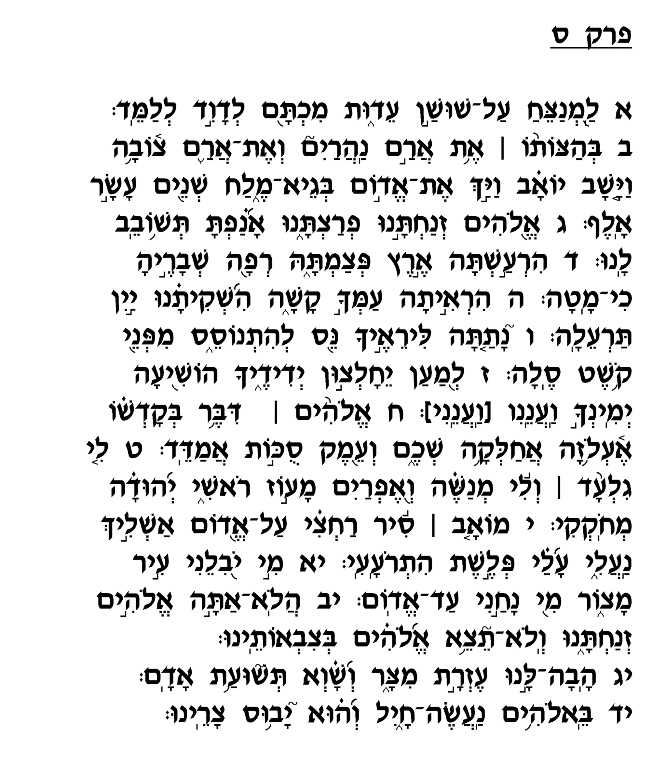 Seemingly conflicting accounts of this battle are recorded there in Shemuel II (8:13), in Divrei Hayamim I (18:12) and here in Tehillim (verse 2). According to Rashi (in his commentary here in Tehillim), David's two generals – Yoav and Avishai – waged different battles as part of the campaign against Edom, and the differing accounts thus refer to these two battles. The significance of these battles is perhaps indicated by the fact that in Shemuel II and Divrei Hayamim I, the verse that describes the victory over Edom concludes by noting, "God saved David wherever he went." These battles brought three neighboring nations under David's control and established his kingdom as the most powerful in the region. It should be noted that prior to these battles, David waged fierce, successful campaigns against two other threatening border nations – the Pelishtim and Moav. This Psalm, then, was composed in the aftermath of a series of major regional wars that left Am Yisrael as the most feared and powerful country in the area, for the first time since the nation's conquest of Canaan under Yehoshua. David begins by recalling the time when the Almighty "abandoned" Am Yisrael by allowing them to come under attack by the neighboring nations (verses 3-6). He then reminisces about God's promise to grant David royal authority over all Israel and dominion over the other countries in the area (verses 8-9), promises which he had been privileged to see fulfilled. In the final verses (11-14), David acknowledges that only through the Almighty's assistance has he been able to penetrate the mighty fortresses of the enemy nations and that only He, and no human being, can bring victory and salvation. He concludes this chapter by triumphantly declaring that God will continue to grant him and his kingdom success and victory over all oppressing nations.